Kitchen poems can help to brighten your day. While looking through my mother's old recipe scrapbooks and handwritten recipe books, I was struck by all the newspaper clippings of poetry that she had placed between the pages of her recipes many years ago. Mom proved that poetry and cooking can work together to lift one's spirit. Let the thoughtful little poems below lighten your busy day and lift your spirit. 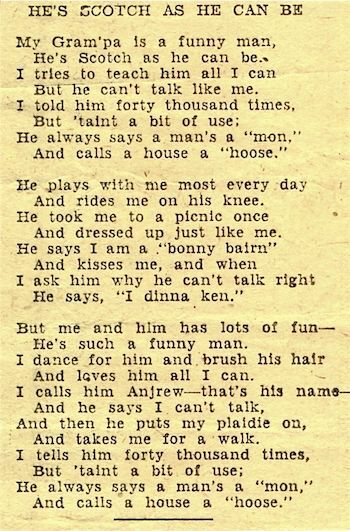 This little poem clipped from a vintage newspaper was given to Mom by my Grannie Bell who being Scottish, took great delight from it. She called it "a cheery wee poem." Perhaps it reminded her of her own grandpa when she was a bonnie wee lass in Uphall, West Lothian, Scotland. 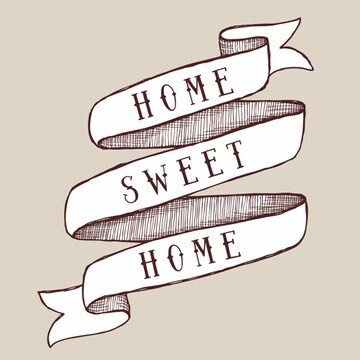 The following poetry must have given Mom strength when days were difficult and things didn't turn out as expected. I gave up trying to keep the score. And the lighthouse winks a merry eye. 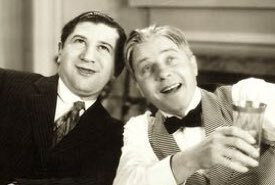 Slimming those who are much too stout. Then gently they're lapping their own lullaby. Playing they're jets and planes and things. Lonely I? How could I be? When there is so much for a lass to see! My Great Aunt Peggy was a remarkable lady and Scottish through and through. She was known for her fancy gelatine desserts and homemade candy, and she loved to write poetry that reflected her bright and optimistic view of life. 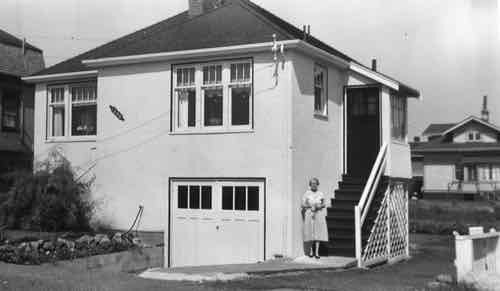 In her latter years, Auntie Peggy lived in her little white house by the sea at 1486 Dallas Road, Victoria, BC. She enjoyed watching the ships and seagulls and on blustery days, she cheerfully wiped the salt spay from her windows and wrote a wee poem. 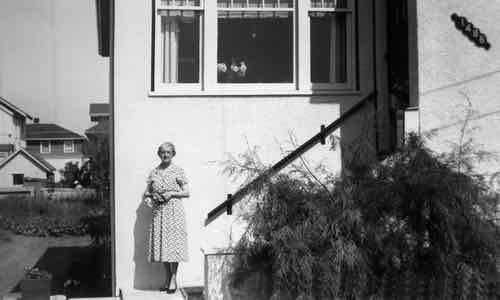 It would've saddened her to know that her beloved little house has since been replaced by a modern duplex structure, but her endearing poetry lives on. The clipping of Auntie Peggy's poem was always kept carefully tucked in Mom's old recipe book and fondly kept as a cheery kitchen poem. 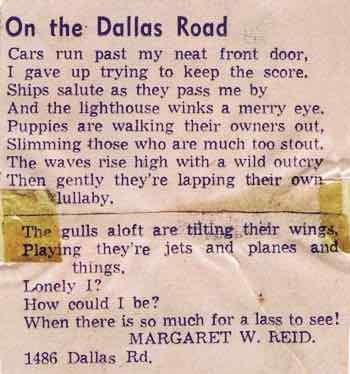 It was published in the Victoria Times newspaper in the late 1950s. And every cook who has ever borrowed a recipe can smile at this one. And asked us out to share. And things we couldn't make. Was Annie's fresh Dream Cake. The Dream was one nightmare. The little kitchen poem that follows likely reminded Mom of her own wooden baking cabinet that stood against a wall in our farm kitchen. The white metal shelf that pulled out for rolling dough was decorated with blue squares in a sort of checkerboard pattern that I improvised to play games on as a youngster. I use the baking board for chess! And breath through my nose. And rub till I glow. And mean all my prayers. And this little kitchen poem is a thoughtful reminder that our time is so precious. I am the Kitchen Clock. A friend, not a slave-driver to be feared. The guide to leisure, not a whip. I measure the minutes that make up life. I tick serene and steady in joy or catastrophe. me too closely means time lost, not gained. I am not your mentor. For I cannot measure the infinite. When is the tomorrow that you fear? Do today the thing's that are today's. Let me work happily with you. Let me play with you. Forget me—and win a race with time. It's the courage you bring to it. And the moan is the finest of foils for laughter! A world of strife shut out. Mom always believed in combining pleasure with her work, and by sandwiching poetry between the pages of her recipes, she had only to turn a page or two to find some helpful thought or word of encouragement or a smile to help her through a long day. Her favorite cooking poetry was always present whenever the days got too stressful or busy, and she needed a boost. 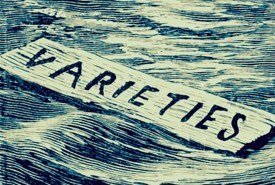 Do you have favorite little poems you've clipped from magazines and newspapers? Try inserting them one by one into your recipe books and have them handy whenever you need a little dose of happiness. Let kitchen poems and cooking be a part of your day!